Gunn’s Hill is on a dirt road about five minutes south of Woodstock. 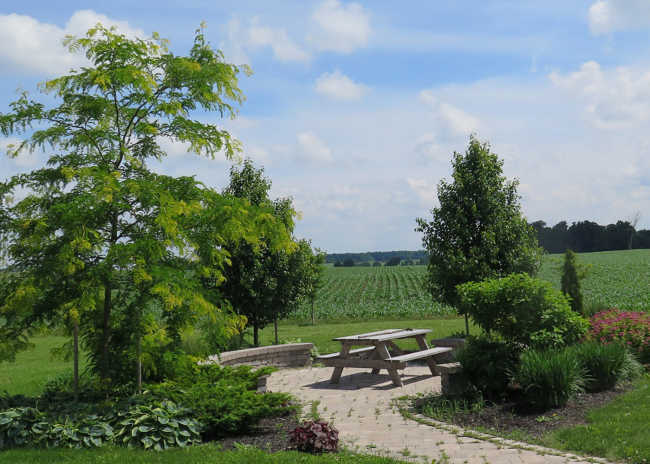 But it’s only a short drive from two of the north-south highways that cross over Highway 401, and it’s a lovely spot with a picnic table and plenty of country charm. Ysselstein lets me try their most popular cheese, Five Brothers (named after the five boys in the family; yikes). It’s got elements of both Swiss and Dutch cheeses, with a smooth, nutty taste. They also make a Beau’s cheese, which is washed with beer from Beau’s brewery in Ottawa. They also do a cheese washed with a wine called Tipsy. 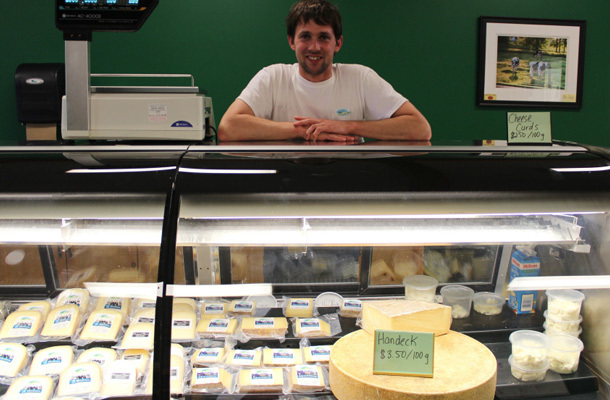 On Friday afternoons, you might find folks lined up to buy their fresh cheese curds. The bounty of southwest Ontario might be on its brightest and best display in and around Woodstock, which has some of the best growing conditions in the province and an up-and-coming foodie scene that’s taking advantage. I stop in the Woodstock Farmers’ Market for perhaps the most luscious strawberries I’ve ever tasted, as well as a beautiful bouquet of flowers that cost me $4; half or a quarter of what I’d pay in Toronto for the same arrangement. 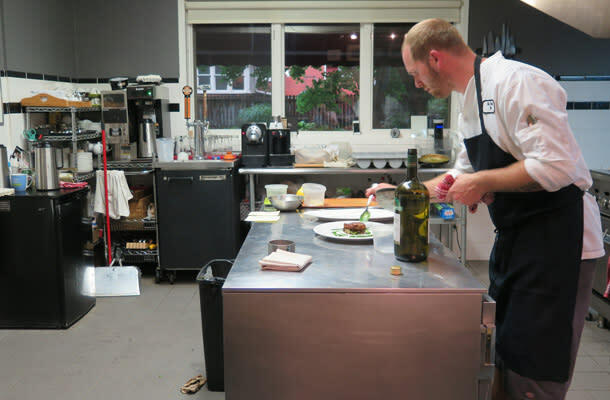 I’m lucky enough to experience a dinner at the highly-rated 639 in Woodstock and sit at the chef’s table as head chef Eric Boyar whirls about his kitchen. He serves up fluffy, crispy potato croquettes with pickled onions (yum) and house-made mustard, as well as a lovely smoked duck that’s cooked sous vide and then flash-fried for just a minute or two. He serves a spiced apple rum cider to cleanse our palates between courses. Boyar, a likable fellow who served at such landmark restaurants as Toronto’s Splendido and Mistura (where he worked with star chef Massimo Capra), buys most of his fruits and vegetables from local suppliers. He gets his trout from just down the road, as well as his meats. “I spend a lot of time on the road, gathering the best products I can find,” he says. “When we came here ten years ago there wasn’t a lot to offer in the Woodstock area in terms of this type of dining. We had to ease into a bit but now it’s become something of a destination spot. We have a younger clientele and we get folks coming in from Kitchener-Waterloo, Hamilton and London. Not far from town is Jakeman’s Maple Products, a family operation that makes maple syrup and maple butter and granulated maple sugar, and, well, you get the picture. Mary Jakeman says she’s the fifth generation in the biz. She takes the time to explain operations to me. And shows me some of the old farm implements and maple syrup containers on display in the shop, which doubles as a bit of a museum. “They didn’t throw anything away, that’s for sure,” Jakeman tells me with a laugh. I take a short walk in Trillium Woods Provincial Nature Reserve, just outside the front door of Jakeman’s, and admire the sunlight filtering through towering overhead trees on a warm, sunny day. As much as some things are changing, it’s good to know other things remain the same. I have a nice fish and chips lunch at Charles Dickens Pub, a fixture in downtown Woodstock for years and a fine example of a British pub. I also take time to admire the tremendously solid homes on Vansittart Avenue in town, including one with a giant tower and others that beckon with giant porches and red-and-white Canadian flags waving in the breeze. I’ve always loved the personal touches and human stories at small-town museums, and Woodstock is no exception. Tour guide Karen Houston shows me a crack on the upstairs floor at the Woodstock Museum, a result of too many people gaily dancing the night away the day World War II was declared over. We also gaze at a display about former mayor Bernadette Smith, elected in 1952 as one of Canada’s first woman mayors. “She was a Catholic at a time when that wasn’t common,” Houston tells me in a whispered hush. “She also was divorced. And a drinker. And she dyed her hair red.” Sounds like a woman I’d have loved to chat with over a beer. I bed down for a couple nights at the historic Elm Hurst Inn and Spa in Ingersoll, which is on the site of the former James Harris Cheese Factory. Harris came here from Massachusetts in 1798, I learn. I also find out during my stay that Ingersoll had the third largest black settlement in Upper Canada prior to Confederation. 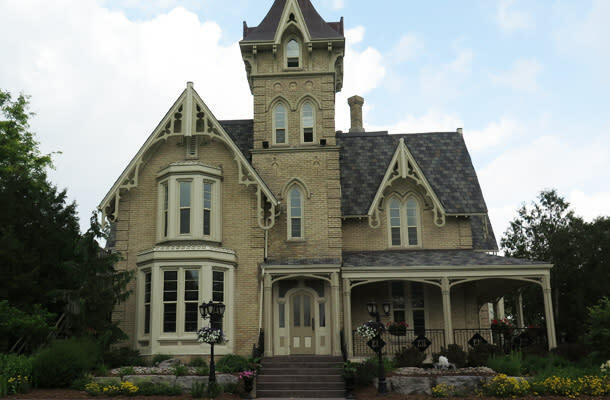 The main house at the Inn is done in a glorious Gothic Revival style, with plenty of flourishes and a sense of real grandeur. The carriage house next door has wooden beams and is great for conferences and weddings. There’s also a great deal of new bits to the Inn, including free Wi-Fi, giving it a best of both worlds approach. My room had a spa tub and lovely marble in the bathroom and a comfy bed, as well as a mini-fridge, a sleek Keurig coffee maker and lots of workspaces. There are fountains galore out front and a lovely glade behind the Inn for weddings or other functions. I didn’t make it to dinner but I did manage a half-hour on the patio with a glass of local wine, listening to a great singer who softly played James Taylor, Garth Brooks, Jimmy Buffett and others. Even better was a brief chat at breakfast the next morning with one of the servers, Christine. Turns out she’s from Liverpool and has kids in Toronto and loves San Francisco. I was born in the San Francisco Bay Area and live in Toronto have always wanted to visit Liverpool. We chatted for only three or four minutes but I found her manner absolutely delightful and her accent charming. The breakfast was great, but I’d return just to talk again with Christine. You can buy awesome hotel rooms all around the world, but special people are something else entirely. See more pictures from this trip and read more of Jim&apos;s adventures at JimByersTravel.com.